This screen is accessed from the back-end Joomla! administrator panel. It is used to add or edit banners which can be displayed on your Joomla! website. Navigate to the Banner Manager. To add a new Banner, click on the New icon in the toolbar. To edit an existing Banner, click on the Banner's Name or check the Banner's checkbox and press the Edit icon in the toolbar. This is where you add a new Banner or edit an existing one. Note that you will need to create at least one Banner Client and one Banner Category before you can create your first Banner. Name. The name of the Banner. This is the name that will display in the Name column of the Banner Manager. Type. The type of banner to display. Options are an image file or custom HTML code. Custom Code (Only displayed for banner type Custom). The HTML code to insert in the place of a banner image file. Image (Only displayed for banner type Image). Image file to display for the banner. Specify the relative path to the banner image to use or click the Select button to browse and select the image file to use. Use the Media Manager to upload Banner image files to your site. Width (Only displayed for banner type Image). The fixed width to resize the banner image to. Leave this blank if you want to use the actual width of the banner image file. Height (Only displayed for banner type Image). The fixed height to resize the banner image to. Leave this blank if you want to use the actual height of the banner image file. Alternative Text (Only displayed for banner type Image). Text to display in place of the banner image in the event the image cannot be displayed. Click URL. The URL to navigate to when the User clicks on the Banner. Description. Description of this category, which can optionally be displayed in the front-end. Created. The date the banner was created. Start Publishing. An optional start date to publish the item. Click the calendar icon to modify this date, or type in a date and time. Finish Publishing. An optional end date for the item. Click the calendar icon to modify this date, or type in a date and time. Sticky. Whether or not the banner is 'sticky'. Max. Impressions. The number of Impressions purchased for this Banner. Impressions are the number of times a Banner will be displayed on a page. Check the 'Unlimited' checkbox if an unlimited number of Impressions is allowed. Total Impressions. The number of times this Banner has been displayed on a web page to a user. No entry is allowed. You can reset this number to 0 by pressing the 'Reset impressions' button. Total Clicks. The number of times this Banner has been clicked. No entry is allowed. You can reset this number to 0 by pressing the 'Reset clicks' button. Client. The Client Name for this Banner. Select one from the drop-down list box of existing Clients. At the top right you will see the toolbar. Whether you selected to create a new banner or edit an existing one will determine what toolbar buttons will be available. 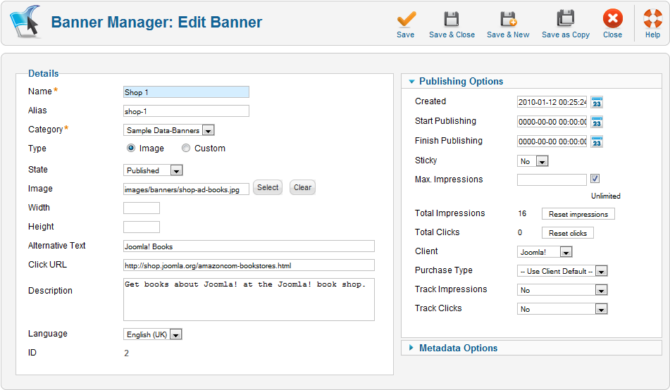 Banners are placed on specific pages by adding Modules of type 'Banners' using the Module Manager. Create the Banners you wish to include, making sure they have the same Client and Category. Create a Banner Module for this Client and Category, and in the Menu Assignment pick the Menu Selections for the module to display on. In the Banner Module, set the 'Randomise' value to 'Sticky, Randomise'. With these settings, the different Banners for that Client and Category will display on the selected pages in random order.